Crrrunch! Is Your Favorite Company About to Go Bust? The fortunes of Six Flags, the country's largest regional theme-park operator, have fallen more steeply than its roller coasters. It's not that the company's 20 parks across North America are all that bad. The management team has worked hard to give the facilities a makeover and offer more family-friendly options. Attendance and revenues actually rose in 2008, despite the onset of the recession and high gas prices last summer. But the company's crippling $2.4 billion debt load led to a $135 million loss last year. Six Flags was $141 million in the red for the first quarter of '09, and this spring the swine-flu outbreak forced Six Flags to close its Mexico park for eight days. In June, Six Flags finally filed for Chapter 11. This could be a make-or-break summer for Six Flags. And in the current economic environment, families will likely sacrifice thrill-ride screams for savings. So why, in the face of such serious challenges, would Six Flags respond by rolling out an ad campaign featuring a widely mocked character that the company's own chairman once said is "misguided" and "weakens the brand"? Why, just when the stakes are at an all-time high, is a bankrupt company putting that creepy dancing old guy back on our TVs? His name is Mr. Six  clever, right?  and his troll-like antics may prevent you from ever setting foot in a Six Flags park, no matter how exciting that Batman ride is. He first popped up in Six Flag ads in 2004, a geriatric sideshow obviously played by a younger actor. Mr. Six dementedly shimmied to the equally annoying late-'90s dance song "We Like to Party" while in the confines of a Six Flag facility. Dressed in a floppy tuxedo and wearing black-rimmed glasses larger than most skyscraper windows, Mr. Six has a wrinkled face, a victim of makeup malpractice, that looks like "someone left a dead turtle in a stagnant pool of water for a month," in the words of one advertising blogger. A New York City radio host wondered if Mr. Six was actually "Junior Soprano out on a bender." The original Mr. Six ads ran from 2004 to 2005. But when Washington Redskins owner Daniel Snyder, Six Flags' largest shareholder, won his bid to take control of the company in late 2005, he ripped the campaign. His management team soon killed the ads. "Mr. Six went on sabbatical," says Angie Vieira Barocas, senior VP of marketing and entertainment at Six Flags. "People associated him with Six Flags, but he wasn't necessarily converting people's intention to visit our parks into actual visitation." So why revive him? "We had a lot of internal conversations about Mr. Six, and we were like, Look, he's beloved by our guests," says Vieira Barocas. "There are definitely people who are not fans of him. But he has more fans than not. And at a time when there's all sorts of uncertainty, people like the familiar and the known." Though if Six Flags thought he had "more fans than not," it seems odd to strike the campaign in the first place. Vieira Barocas contends that the original commercials put the gyrating gnome too front and center. Now he has more of a supporting role. 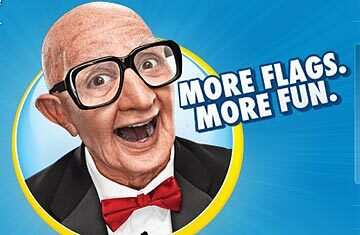 In the new ads, Mr. Six rates the fun of various activities on a scale of 1 to 6 flags. Throwing a baseball at your dad's crotch? "Two flags," Mr. Six chirps. Riding a Six Flags roller coaster? "Six flags," Mr. Six tells us in a voice that sounds like a cooing father on speed. "More flags, more fun." The new commercials are receiving scathing reviews. "It's a pretty miserable piece of advertising," says Barbara Lippert, a critic for Adweek, the trade publication. "It's as dumb as can be, and talks down to us. He's like an Elmer Fudd who never made it out into the country." Every moment of a 30-sec. spot is valuable. Why sacrifice precious time to a character with no natural connection to an amusement park? And how exactly does a creepy old man in a bow tie appeal to the kids that drive Six Flags' business? "I don't think many 11-year-olds relate to George Burns types," says Lippert. Hey, don't insult a late, great funnyman by comparing him to Mr. Six. Six Flags has talked to parents, Vieira Barocas insists. And for the most part, their children give Mr. Six rave reviews. "It's not about his age," she says. "It's about his spirit." According to the company, market research shows Mr. Six has fans of all ages. "We know he's a polarizing character," Vieira Barocas says. "But on any day I would rather that someone have an opinion about us and our brand than for him to just melt into the background with all the other advertising that is out there. Would I prefer that you and other critics find him appealing? Absolutely. But I will take the fact that you notice, that you hear our message and that you have a point of view." The buzz can surely help, but to a point. Is Mr. Six actually driving incremental traffic to Six Flags? Viewers are already cash-strapped. Why potentially turn them off with your spots? "Sure, the ad sticks Six Flags in your mind," says Lippert. "But it's wedged in the area that causes extreme anxiety and annoyance. You're saying, 'Get this out of my lobe.' "
Fast. So what's Mr. Six's message anyway? "Look, he's fun," says Vieira Barocas. "He's interesting. He represents our parks, which are thrilling and a place where you can go to let loose and actively participate in life. You can come to Six Flags and push yourself to extremes. He represents the emotional need that people have to accomplish something and perform at their best." Huh? For many, Mr. Six just represents the emotional need to change the channel. And perhaps ditch Six Flags forever. See the top 10 tasteless ad campaigns.